"Fox News @ Night" Executive Producer Christopher Wallace said the show displayed “unrelated footage of players kneeling in prayer"
Several Eagles players as well as local politicians are speaking out after President Donald Trump disinvited the team to the White House and held an event named a "Celebration of America" instead. Fox News apologized on Tuesday for airing footage that wrongly suggested Philadelphia Eagles players knelt during the national anthem to protest racial injustice. Christopher Wallace, executive producer of "Fox News @ Night," said in a statement that during the show’s report about President Donald Trump canceling the Eagles’ visit to the White House to celebrate the team’s Super Bowl win, the show displayed "unrelated footage of players kneeling in prayer." The 33-second report aired late Monday with four still pictures of the Eagles shown in the background of Shannon Bream's narration. She said that the cancellation was due to "the national anthem controversy," where some NFL players knelt during the "Star Spangled Banner" last season to protest police brutality. "To clarify, no members of the team knelt in protest during the national anthem throughout regular or post-season last year. We apologize for the error," Wallace said. The network tweeted a copy of the Wallace's statement on its news account and said the error would be addressed on the television. Eagles tight end Zach Ertz, who was in two of the pictures used by Fox during the segment, accused the network of misrepresenting "praying before games" for their "propaganda." Defensive end Chris Long similarly expressed his frustration, tweeting that "Fox News used the faith of Christian men dishonestly to push an agenda. That wasn't an 'error,' but intentional and strategic." "You're complicit in PLAYING America," Long wrote, noting in another tweet that "not one Eagles player knelt for the anthem this year." You’re complicit in PLAYING America. This is just another day at the office for you, though. Most players (and there were many players, many players...) that wanted to opt out had decided long b4 the anthem rule came down. It wasn’t discussed once in our meetings about the visit. The Eagles, who defeated the New England Patriots in Super Bowl LII in February, scheduled their visit to Washington, D.C. last month. White House Deputy Press Secretary Lindsay Walters told reporters May 17 that the team planned to meet with Trump. 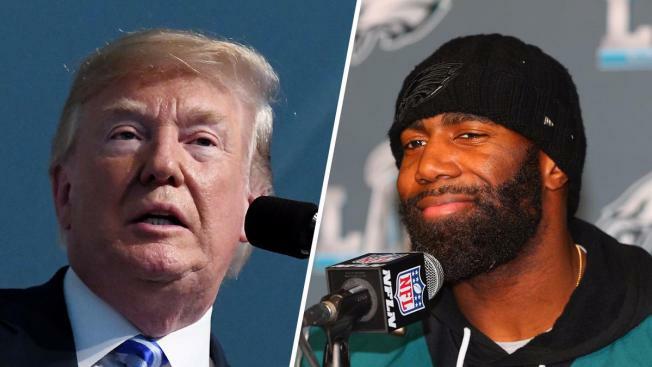 But Monday night, Trump announced that the White House canceled the event, citing the small number of attendees and criticizing Eagles players for staying in the locker room while the national anthem was played. In a statement, the White House said the Eagles contacted administration officials Friday to reschedule the event, explaining that few players would be able to attend. "The Philadelphia Eagles are unable to come to the White House with their full team to be celebrated tomorrow," the president said in a statement Monday night. "They disagree with their President because he insists that they proudly stand for the National Anthem, hand on heart, in honor of the great men and women of our military and the people of our country." The team didn’t respond to the cancellation in its statement. In August 2016, former San Francisco 49ers Quarterback Colin Kaepernick remained on the team’s bench while the anthem was played. Kaepernick at the time said he was protesting racial injustice and police brutality. Several athletes followed suit last season. Last month, NFL owners approved a new rule that provides players with the opportunity to remain in the locker room until the anthem concludes. Players on the field will be required to stand. It isn't the first time Trump has rescinded a championship team's invite to the White House. After their 2017 NBA win, Golden State Warriors guard Stephen Curry said he would not make the traditional White House visit. Trump then rescinded the invite in a tweet. Instead, the team took local children to the National Museum of African American History and Culture, according to the Associated Press.